Here’s a cool online resource when your high-living Executive type says he/she wants something really cool and different for their next high-level retreat. Chateauform’ has been operating venues dedicated to corporate meetings and events in Europe since 1996. Today these 45 “houses” are located in France, Belgium, Italy, Spain, Switzerland, Germany, and … China (which as far as I remember is not in Europe…yet). They are situated in countryside settings close to major European cities with easy access to and from international airports and with breathing space for working, reflection and relaxation. www.gigsalad.com… Their web site says… “Over 80,000 bands, entertainers and event services for hire”. I did not count. They also say they are “the largest and most diverse marketplace for entertainment and event services”. I do not know if that is true, not that it matters. It’s a cool resource and they have some very impressive testimonials to back it up. Think of it as a specialized search engine targeting the kind of stuff meeting planners need. First type in the type of service you are looking for (team builders, party bands, face painters, comedians, whatever (and I mean whatever), and then you type in your location. Somehow electrons, bits, bytes, zeros, ones… they do their thing… and voila… recommendations appear. I have no idea how that works and despite what you say, you don’t really know either. For those who are organizing events—anything from a small weekend gathering to a grand gala—you get connected with your local talented performers and vendors. And then you can connect with and book through their system. At least check it out. You will like it (and they seem nice). Breather.com I asked my contact to describe the service. Is it, I asked, like other meeting space search engines that style themselves as “the Air BnB” of meeting spaces? He said, nope. Think of it as the “ZipCar” of meeting spaces. For the most part, Breather either owns or leases the spaces. They are not the middleman. 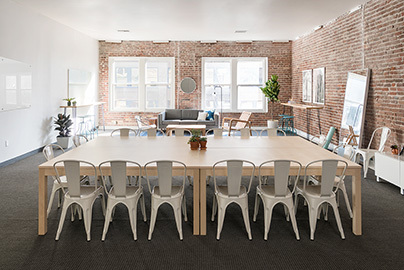 They say… Breather spaces are available on-demand, and can be rented by the hour, by the day or by the week. With close to 200 locations in 10 cities (at the moment) you'll find a Breather when and where you need one. The only thing you'll need to access Breather is your smartphone– reserve a space and unlock the door with a unique PIN code when you arrive. Note… currently their inventory contains rooms comfortable to fit as few as 2 people and as many as 75, Whether your team needs white glove service and catering for 50, or just need some space to talk, Breather's has options. All rooms include free high-speed wifi, a work and lounge area, as well as AV equipment.